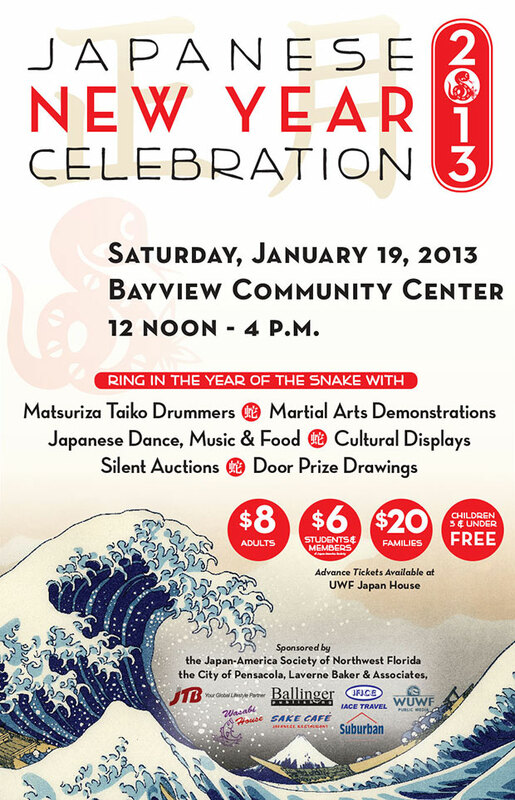 The Japan-America Society of Northwest Florida will usher in the “Year of the Snake” with its 20th annual Japanese New Year Celebration on Saturday, January 19, 2013, at the Bayview Community Center in Pensacola. Festivities will take place from 12 noon until 4 p.m. and will include performances by the popular Matsuriza taiko drummers, martial arts demonstrations, traditional Japanese dancing, music, food, and other cultural displays. A silent auction and raffle will also be held, and ticket holders are automatically eligible for door prize drawings. Ticket prices are $8 for adults, $6 for students and Japan-America Society members, and $20 for families. Children ages 3 and under enjoy free admission. Advance tickets are available at the UWF Japan House or may be purchased at the event.